The Mac Mail app has gained tab support in the latest versions of Mac OS X, making it easier to juggle multiple emails on screen at once. There’s a catch with using Mail Tabs in MacOS X, however, and that is you must be using full screen mode to gain access to the tab feature. Perhaps because of this, email tabs are particularly useful for laptop users with smaller screens, but this could also appeal to users who like to minimize distraction. Additionally, you can also use Mail tab emails with Split View, so it’s quite useful for productivity. As mentioned already, if you like to use Mail tabs feature but need to gain access to some other data elsewhere in MacOS X from another application, you can put the app into Split View mode and share the screen with another app side by side. Note if you exit Mail app from full screen mode, you’ll lose the tabbed emails instantly, with each appearing as a separate email message composition window as usual. This means if you had quite a few tabbed emails open, you’ll end up with some window clutter by leaving full screen in Mail app. As mentioned before, this requires Mail app in OS X El Capitan or newer, so if you’re on an older version of Mac OS or Mac OS X you will not find the tabbed email feature available. I am disappointed this requires being in full screen mode to access. I do not like full screen at all, I find it a poor experience on a 24″ display, waste of space. But I would like to use Mail tabs! Maybe a future version will bring this to all mail windows. But we’re not trying to iOSify things, honest. 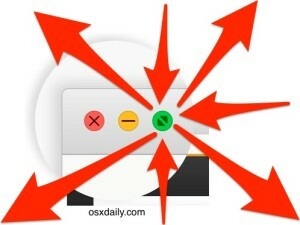 Tabs are a blinding flash of the obvious, typical at Apple these days. Another way to do this, though not as elegant, but uses no screen space is minimize all open emails and use the Window menu. How hard is that? I thought I was the only one. I would actually use it if they made just the app full screen, but they had to go stick it on a new desktop. My 6 desktops is enough, well 7 if I have VMWare running. I’m on El Capitan. I do not get tabbed windows, I get the old style frozen window in front of mail. (I hate that!) I see nothing in preferences, nor nothing in the menu to enable tabs. I can’t grab the title bar and drag it. I’m on Mail 9.2 (3096.5). Ideas? 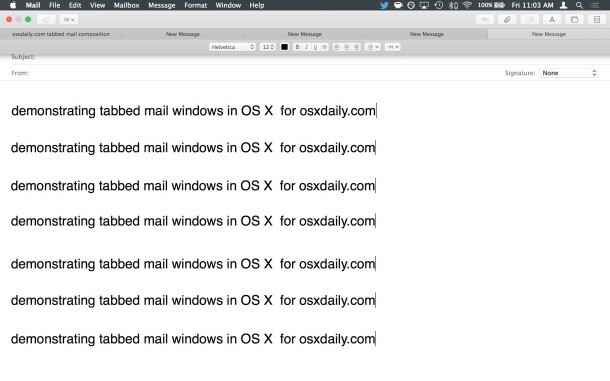 To access Mail tabs, go into FULLSCREEN mode in Mail app, then compose a NEW email message. Then compose another new email message. There’s your tabs. Ah, Thank you! I was expecting the tabs to be a part of the message viewer window, not the email window. Hence, I never tried to open the second new email. It pays to read attentively & follow the instructions closely! My tabbed composition windows are different than the screenshots in this post. In this post, the tabs appear to be in the primary mail window. You can tell b/c the green maximize button is available at the top (check the first image on this post) and that maximize button doesn’t appear in an overlaid compose window – even when multiple tabs are open in the overlay. I can create multiple email drafts but they STAY in the overlay and can’t be maximized or docked to the main window. I would love the functionality shown here. Perhaps there is some little box that needs to be ticked? I could not find the tabs at all, but then I noticed they were at the bottom of the Mail window and not at the top as they were in the screen grab I was looking at. Did Apple change the location after releasing some shots showing them at the top? or can you choose whether they are at the top or bottom? Anyone know? …hate all the glorious “new” features which are a step backwards… on my opinion. In my old version, 10.8., I had for mail-tabs a third party plug in, which worked absolutly fine. And that worked perfect in all size! They canceled aparture…, my lovely “total finder” doesn’t work any more, even Photoshop (cs 5) needs some additional old stuff, and so on. Im using Mac for almost 10 Years now. On our family computer we use Win 10, which work really fine. Photoshop (cs 5) runs like on XP and adjustments are pretty easy…. So, I’m really thinking to go back to WIN on my notebook, too. 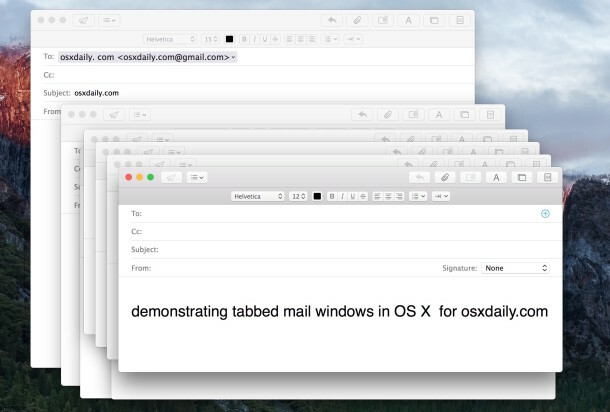 A nice add on for this would be convert all emails in seperate windowsto tabs.